WiKi Hosting Review 2019: Is WiKi Hosting a Good Hosting? Despite being a relatively new web hosting company, WiKi Hosting provides solutions that easily knock off some older web hosting providers. They offer affordable shared, WordPress optimized, PHPVMS, VPS, and dedicated hosting to businesses of all sizes in Pakistan. When it comes to helping businesses and individuals build a smart team, maintain, and expand their online presence, WiKi Hosting has it down. They were founded in 2012 to provide the most reliable web hosting services in Pakistan. Despite being relatively new to the hosting industry, they’ve lived up to that mission and more with their vast range of hosting packages and other resources. Their plans serve both novices and experienced webmasters, as well as small to large businesses. They operate a website in English. The Windows shared hosting is managed on Plesk and comes fully installed with ASP.NET 2.0, 3.5, and 4.0. You also get databases run on MsSQL, MySQL, and Access. WiKi Hosting’s Linux shared hosting is fully secured with CloudLinux and CageFS; they both work to increase the efficiency of the server by monitoring and containing resource spikes from the accounts sharing one server. That way, a traffic spike or need for more resources from another user doesn’t affect your website, keeping yours stable and secure. Considering they provide CLoudLinux with cPanel as the management panel, you can choose the PHP version you need and use more than 50 PHP extensions. The plans are beginner friendly and easy to use. The one-click application installer, Softaculous, is on the cPanel for you to install applications. The Weebly website builder is also available. You don’t need to know how to code to use it, just choose any of its pre-made themes and drag-and-drop your website design. You can also go for the WordPress optimized hosting. It’s run on one of the most powerful processors, having hexa (six) CPU cores. Another plus is the SiteLock Anti-Malware that they provide. It protects up to 500 pages on each website you host. WiKi Hosting solutions are budget-friendly. While the single domain shared hosting plans are priced exactly as expected, the unlimited shared plans and the WordPress packages are unexpectedly cheap. Given that you get 10GB CodeGuard cloud backups on the WordPress hosting and it’s on a globally distributed CDN, it’s a big steal. Another plus is that you can add resources as you need them without having to upgrade your plan. The PHPVMs for virtual airlines and VPS hosting are reasonably priced as well. WiKiHost provides exceptional customer support, with response times as low as a few minutes on support tickets. They’re also accessible via web chat, WhatsApp messenger, Facebook messenger, email, and phone. There is a knowledge base link presented however no information within, so you’ll have to rely on their technicians. If you’re in need of a budget-friendly and reliable host, WiKi Hosting is the vendor for you. Their affordable plans, high server performance, robust resources, and ease of use make them a worthwhile web hosting provider. 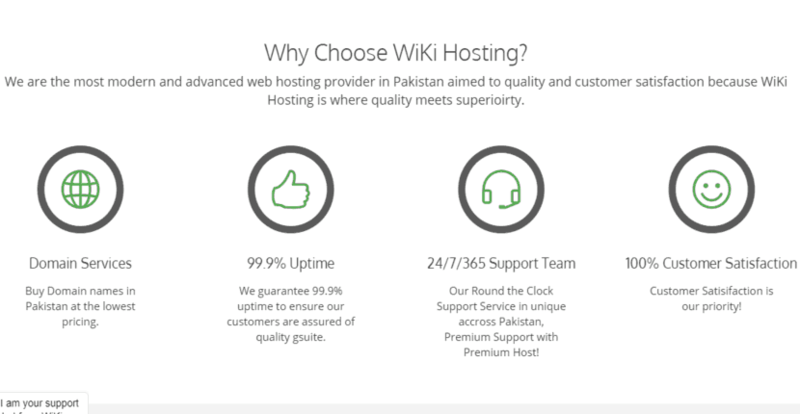 Wondering how WiKi Hosting stacks up against other Web Hosting companies? Enter any other Web Hosting company and we will give you a side-by-side comparison.